Stumbled across another neat generator tonight. It’s called Wordle and was created by Jonathan Feinberg. You create a word cloud, either by entering words yourself or by putting in your blog address and letting it take random words from your posts to make the cloud. Then you can change the colors and fonts, how cool is that? If you embed it with the code you get a small linked version, but I did the screen-capture-paste into my photo program trick to get a bigger version. Give it a try. It takes a couple of minutes to create the cloud but it’s fun to sit back and watch the words appear, thanks for the fun toy Jonathan! This entry was posted in blogging, generators and tagged blogging, generators, word cloud, words by Lilli Day aka bookbabie. Bookmark the permalink. 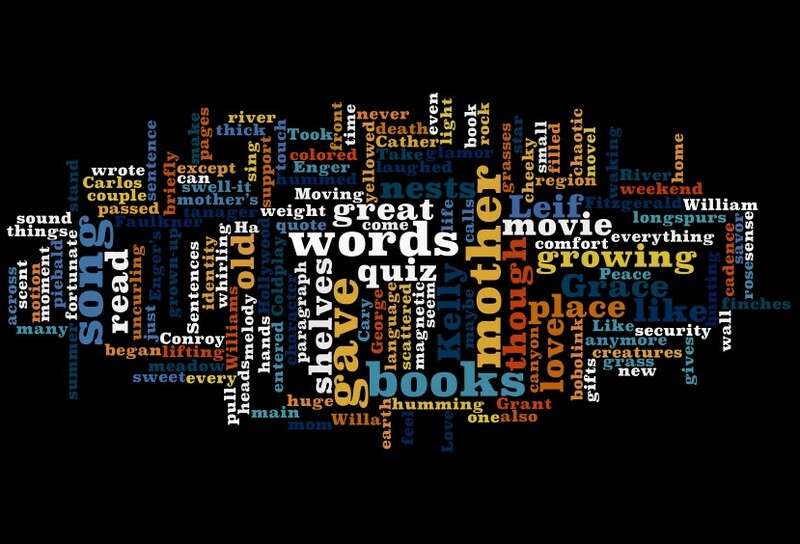 wouldn’t your word cloud have a rather large Clooney in it? I don’t mind if tomorrow it rains, clooney drops and drips all over the world. Good idea Cara, I didn’t think to hit the print button and make paper copies, duh!